Background Crohn’s disease (CD)-associated dysbiosis is characterised by a loss of Faecalibacterium prausnitzii, whose culture supernatant exerts an anti-inflammatory effect both in vitro and in vivo. However, the chemical nature of the anti-inflammatory compounds has not yet been determined. Methods Peptidomic analysis using mass spectrometry was applied to F. prausnitzii supernatant. Anti-inflammatory effects of identified peptides were tested in vitro directly on intestinal epithelial cell lines and on cell lines transfected with a plasmid construction coding for the candidate protein encompassing these peptides. In vivo, the cDNA of the candidate protein was delivered to the gut by recombinant lactic acid bacteria to prevent dinitrobenzene sulfonic acid (DNBS)-colitis in mice. Results The seven peptides, identified in the F. prausnitzii culture supernatants, derived from a single microbial anti-inflammatory molecule (MAM), a protein of 15 kDa, and comprising 53% of non-polar residues. This last feature prevented the direct characterisation of the putative anti-inflammatory activity of MAM-derived peptides. Transfection of MAM cDNA in epithelial cells led to a significant decrease in the activation of the nuclear factor (NF)-κB pathway with a dose-dependent effect. Finally, the use of a food-grade bacterium, Lactococcus lactis, delivering a plasmid encoding MAM was able to alleviate DNBS-induced colitis in mice. Conclusions A 15 kDa protein with anti-inflammatory properties is produced by F. prausnitzii, a commensal bacterium involved in CD pathogenesis. This protein is able to inhibit the NF-κB pathway in intestinal epithelial cells and to prevent colitis in an animal model. Crohn's disease (CD)-associated dysbiosis is characterised by low proportion of Faecalibacterium prausnitzii in faecal and mucosa-associated microbiome. Loss of F. prausnitzii is predictive of CD relapse after surgery or in patients treated with immunosupressants. F. prausnitzii exhibits anti-inflammatory effects in vitro and in vivo by secreted metabolites that block nuclear factor (NF)-κB activation. F. prausnitzii produces bioactive peptides derived from a single 15 kDa protein (ZP05614546.1) of unknown function named microbial anti-inflammatory molecule (MAM). MAM expression in epithelial cell lines is able to block the NF-κB pathway. Lactococcus lactis harbouring a MAM-cDNA encoding plasmid is able to alleviate dinitrobenzene sulfonic acid-colitis in mice. How might this impact on clinical practice in the foreseeable future? Discovery of anti-inflammatory molecules from a commensal bacterium such as F. prausnitzii constitutes the first step towards new anti-inflammatory drugs in CD. Knowing the predictive value of F. prausnitzii for CD relapse, MAM could represent a targeted biomarker for CD. Evidence from immunological, microbiological and genetic studies implicates abnormal host-microbial interactions in the pathogenesis of Crohn's Disease (CD).1–5 Dysbiosis characterised by a reduction in bacterial biodiversity, lower bacterial population with anti-inflammatory properties and/or an increase in the proportion of bacteria with pro-inflammatory properties, has been observed in patients with CD.6 Several bacterial species have been associated with CD, including members of the Proteobacteria7 such as adherent-invasive Escherichia coli,8 Campylobacter concisus9 ,10 and enterohepatic Helicobacter.11 ,12 So far, no definitive proof for any specific aetiological agent has been highlighted. Additionally, several 16S rRNA sequencing-based studies have reported that members of the Firmicutes phylum were reduced in patients with CD.13 In previous work, we analysed the composition of the ileal mucosa-associated microbiota of patients with CD at the time of surgical resection for active disease, and 6 months later. Low proportions of Firmicutes, and particularly of Faecalibacterium prausnitzii, were consistently associated with an increased risk of postoperative recurrence of ileal CD.14 Although controversial,15 we hypothesised that treatment with F. prausnitzii could be an effective strategy to counterbalance dysbiosis and reduce inflammation in patients with CD. Following this, we and others demonstrated that F. prausnitzii exhibits anti-inflammatory effects both in vitro (cellular models) and in vivo (trinitrobenzene sulfonic acid (TNBS) colitis model), associated with secreted metabolites that block nuclear factor (NF)-κB activation and interleukin (IL)-8 production by intestinal epithelial cells.14 ,16–18 Moreover, gnotobiotic rodent models were previously used to show beneficial effects of F. prausnitzii on intestinal homeostasis and during an acute colitis.19 ,20 Identification of the active molecule(s) involved in this protective effect is of particular interest, since F. prausnitzii remains hardly cultivable due to its extreme oxygen sensitivity. Thus, finding the secreted molecule(s) responsible for this anti-inflammatory effect seems a cognitive issue and will also open the field of new therapeutic approach in CD. The cellular and molecular effects of commensal and probiotic bacteria are now recognised. Some bacteria have been shown to reinforce the intestinal barrier through the production of a soluble factor either by normalising intestinal permeability of inflamed tissues21 or inducing the expression of defensins22 and type 2 zona occludens proteins in tight junctions between epithelial cells.23 In mice, some commensal bacteria such as segmented filamentous bacteria,24 ,25 Bacteroides fragilis and Clostridia members are able to shape gut immune responses.26–29 Among the molecules secreted by non-pathogenic bacteria, which are responsible for cellular effects in the host, very few bioactive molecules have been identified.30 ,31 An example of previously identified bioactive molecules can be seen in Lactobacillus rhamnosus GG, which secretes two proteins, p75 and p40, which have been characterised as being able to inhibit epithelial cells apoptosis induced by pro-inflammatory cytokines.32 Small molecules, less than 10 kDa, from Saccharomyces boulardii and Bacteroides thetaiotaomicron that interact with NF-κB pathway have been detected but remain unidentified.33 ,34 Searching for such bioactive molecules remains challenging as finding these molecules in a cultured supernatant containing thousands of molecules is comparable with searching for a needle in a haystack. Preliminary experiments indicated that various treatments of F. prausnitzii supernatant (heated >70°C), enzyme digestion (trypsin, lipase, amylase) or filtration (mass weight (MW)<15 kDa) do not suppress anti-inflammatory effects (M A Maubert, unpublished data). This prompted us to develop a peptidomic analysis of the supernatant in order to identify the presence of potential peptides derived from a unique and original protein from F. prausnitzii, which are able to interact with the NF-κB pathway in epithelial cells and are responsible for the anti-inflammatory effects. F. prausnitzii (strain A2-165) was grown overnight at 37°C in an anaerobic (90% N2, 5% CO2 and 5% H2) workstation (Whitley A35 anaerobic workstation) in LyBHI broth, 37 g/L of brain-heart infusion (Difco) and 5 g/L of yeast extract (Conda) at pH 7. The culture supernatant of F. prausnitzii was obtained by centrifugation at 1700 g at 4°C for 20 min. A solid/liquid extraction of culture medium using Waters Oasis HLB solid phase extraction (SPE) cartridges was carried out. Fractions were obtained by eluting with 20%, 40% and 80% of acetonitrile (F1, F2, F3 for F. prausnitzii supernatant and F1′, F2′, F3′ for LyBHI culture medium). After freeze-drying, these fractions were tested on epithelial cells through a cellular assay for anti-inflammatory effect (see below). For further investigations in mass spectrometry, F2/F2′ fractions were puriﬁed by preparative high-performance liquid chromatography (HPLC) using a Waters Symmetry C8 column (7.8×300 mm). The bioactive anti-inflammatory fractions from the culture supernatant and LyBHI fractions eluted by SPE were analysed by matrix-assisted laser desorption/ionisation-time of flight (MALDI-TOF) mass spectrometry (Voyager DE Pro AB Sciex). The ions of interest were fragmented by a Fourier transform-ion cyclotron resonance (FT-ICR) mass spectrometer, equipped with a 7T superconducting magnet (Apex Qe, Bruker Daltonics). The peptides were then identified by complete de novo sequencing. All protected amino acids were commercially available from Iris Biotech GMBH or Bachem. Peptide syntheses were carried out on a 0.1 mmol scale using an ABI Model 431A peptide synthesizer (Applied BioSystems), starting from the appropriate Wang Tentagel resin, with 10 equivalent of the protected Fmoc-amino acid and HBTU/DIEA for the activation. The crude peptides were purified by HPLC to obtain purity over 97%. The gene encoding the microbial anti-inflammatory molecule (MAM) protein was PCR amplified from genomic DNA. PCR product was digested, purified and cloned in pSTABY plasmid and introduced in Escherichia coli. Protein extraction was carried out and verified by Coomassie blue staining and western blot. Intestinal epithelial cell lines (Caco-2, HT29 and mucus-secreting HT29-MTX), from the European Collection of Cell Cultures (Wiltshire, UK) and INSERM U505 (Institut des Cordeliers, France), were cultured in supplemented Dulbecco's modiﬁed Eagle's medium (DMEM) (PAA Laboratories) at 37°C in a 5% CO2 incubator. Cells were incubated with different F. prausnitzii supernatant fractions (1/100, 1/500 and 1/1000 dilutions in DMEM medium) or molecules of interest (2–10 µM) and, according to the cell lines used, stimulated with various pro-inflammatory cytokines (IL-1β 15 ng/mL or tumour necrosis factor-α 10 ng/mL). After 6 h incubation, cell supernatants were removed for IL-8 analysis. Protein concentrations were determined in cell lysates using bicinchoninic acid protein assay (Pierce, Rockford, Illinois, USA) according to the manufacturer’s instructions. The IL-8 level was determined in duplicate in cell supernatants using ELISA kit DuoSet (R&D systems, Minneapolis, Minnesota, USA). Effect on NF-κB pathway (phosphorylated and total JNK, P38, ERK1/2, IκB, NF-κB) of F. prausnitzii supernatant was tested on Caco-2 cell line using multiplex assay (Bio-Plex Bio-Rad). The cDNA encoding the protein ZP05614546.1 was cloned in 3×Flag (C-term) plasmide with cytomegalovirus promoter (pCMV) vector. Transfection was performed using transfectin Lipid reagent (Bio-Rad) in opti-MEM medium (Gibco, Life Technologies) in different epithelial cells, namely HEK293T, HT29 and TLR4/MD2/CD14 stably-transfected HEK293T (Invivogen). Different concentrations of cDNA, depending on the considered plasmid, were used: 0.8 ng/µL of the plasmid MAM, the plasmid containing cDNA of Carma1 and their empty equivalents, 0.08 ng/µL of the NF-κB reporter plasmid and 0.2 pg/L of the Renilla luciferase control reporter vector. For HEK293T-TLR4/MD2/CD14, activation of the NF-κB pathway was performed by administration of lipopolysaccharide (LPS) 100 ng/mL (Sigma-Aldrich). Positive control of inhibition of NF-κB pathway was obtained with SN50 50 µM (Enzo Life Sciences). NF-κB reporter assay was carried out, after 24 h incubation, using Dual-Luciferase Reporter Assay system (Promega). In the same manner, MAM activity on STAT3 pathway, activated by colivelin 0.1 nM (Santa Cruz Biotechnology), was evaluated. HeLa or HEK293T (both from American Type Culture Collection) cells were grown in DMEM (Invitrogen) with 10% fetal calf serum (HyClone) at 37°C and 5% CO2. Twenty-four hours following transfection, cells were washed and fixed. Cells were stained using appropriate antibodies for 1 h. Cells were imaged using a Leica SP5 confocal microscope. MAM encoding plasmid (pILMAM) was created by a fusion between pIL25335 cut with PstI (Fermentas) and pCMV including DNA of MAM (see above) cut with Sbf1. Empty equivalent (pILEMPTY) was created using the same method, but with fusion of pIL253 empty pCMV. pILMAM and pILEMPTY were transformed in Lactoccocus lactis MG1363 as described by Langella et al.36 L. lactis strains were thereafter grown on M17 medium. Mice were fed with L. lactis harbouring pILMAM or pILEMPTY plasmid. After acclimatisation, bacterial suspensions of L. lactis MG1363 (5.109 Colony Forming Unit (CFU) in 200 µL) were administered to mice (C57BL/6, 6weeks, male) daily by intragastric gavage from day 7 before until day 3 after induction of colitis. Dinitrobenzene sulfonic acid (DNBS) solution in 30% ethanol was administered intrarectally (at a dose of 100 mg/kg body weight). Inflammation was monitored 72 h after DNBS administration. Mice were weighed before DNBS administration and at killing. Two groups of eight mice were investigated, fed with L. lactis harbouring pILMAM or pILEMPTY. Experiments were performed three times. The colon was removed, dissected free of fat and mesentery, carefully opened and cleaned. Colon length was measured. Colonic damage and inflammation were assessed blindly according to the Wallace criteria. For histological assessment, a colon sample located in the most inﬂamed area was ﬁxed in 4% paraformaldehyde acid (Sigma) and embedded in parafﬁn. Four micrometre sections were stained with H&E and examined blindly according to the method described by Dieleman et al.37 Histological scores were carried out according to Ameho criteria. Small and large intestines were dissected, washed, cut in 1 cm pieces and incubated for 20 min at 37°C, 250 rpm in extraction buffer (EDTA 5 mM, dithiothreitol 0.145 mg/mL, 25 mM hydroxyethyl piperazineethanesulfonic acid, 50 µM 2-mercaptoethanol (Sigma), Roswell Park Memorial Institute (RPMI) (Lonza)). After incubation, remaining solid tissues were withdrawn. Incubation mix containing epithelial cells was centrifuged and pellets lysed by ultrasound in cold phosphate-buffered saline (Lonza). After centrifugation, supernatant was kept at −80°C in RNAlater (Qiagen) and RNA was extracted with RNeasy Mini Kit (Qiagen). Retro Transcription was performed using SuperScript II Reverse Transcriptase (Sigma) with random primers. RT-PCR for MAM mRNA detection was performed using Phusion High-Fidelity DNA Polymerase (Thermo Scientific) with the following primers: 5′-ACTCTGGTTGGCAACACCTT-3′ and 5′-CGATCGGGTTGCCCTTAACA-3′. Immunoblotting targeting the FLAG region of the MAM expressed protein (pILMAM construct) was used to detect MAM in purified epithelial cells from gut mucosa of sacrificed mice (on day 3). Lymphocyte suspensions were prepared from the mesenteric lymph nodes (MLN) by pressing cells through a 70-mmol/L Falcon nylon cell strainer (BD Biosciences, San Jose, California, USA). Lymphocytes were counted by flow cytometry (Accuri C6), resuspended in culture medium (RPMI, Lonza with 100 units of streptomycin/ penicillin, PAA Laboratories and 10% fœtal calf serum (SVF), Lonza) and activated with coated anti-mouse antibody CD3e and CD28 (eBioscience). Cytokine production was assessed in supernatant by ELISA (IL-17A and interferon (INF)-γ, Mabtech) after 48 h incubation. Caecum content of gnotobiotic mice harbouring F. prausnitzii (A2-165) and Escherichia coli (K-12 JM105) subjected to 2,4,6-TNBS-induced acute colitis were gifted by Sylvie Miquel and Muriel Thomas. To obtain dixenic E. coli/F. prausnitzii-diassociated mice, BALB/c germfree mice (obtained from the germfree rodent breeding facilities of Anaxem-Micalis; INRA, Jouy-en-Josas, France) were orally inoculated with a fresh culture of E. coli JM105 (108–109 CFU/mL). Following this, the E. coli monoassociated mice were inoculated with F. prausnitzii A2-165 as previously described.19 One month after the stable implantation of the two strains, mice were intrarectally inoculated with 2,4,6-TNBS (50 mg/kg body weight) to induce acute colitis, or with the vehicle (0.9% NaCl–ethanol) to obtain control mice.20 Inflammation was monitored 48 h after TNBS administration. 250 µL of phenol pH4,8/chloroform-isoamyl alcohol (5:1) (Sigma) was added to caecum contents and the mix was agitated strongly. After shaking, 12.5 µL of sodium dodecyl sulfate (SDS) 20% and 25 µL of sodium acetate at 3 M pH8 were added. Samples were mixed with fast prep 40 s at power 5 and 20 s at power 5, followed by centrifugation for 15 min at 13000 g. Superior phases were mixed with 250 µL of chloroform-isoamyl alcohol and centrifuged. Superior phases were treated with High Pure RNA Isolation Kit (Roche) according the manufacturer’s instructions. Retrotranscription was performed using SuperScript II Reverse Transcriptase (Sigma) with the following primers: 5′-ACTCTGGTTGGCAACACCTT-3′ and 5′-CGATCGGGTTGCCCTTAACA-3′. RT-PCR for MAM mRNA detection was performed using Phusion High-Fidelity DNA Polymerase (Thermo Scientific) with the following primers: 5′-ACTCTGGTTGGCAACACCTT-3′ and 5′-CGATCG GGTTGCCCTTAACA-3′. Statistical analysis for significant differences was performed using Student's t test or Mann-Whitney test when appropriate using JMP software (Abacus Concepts, Berkeley, California, USA). Animal experiments were performed three times. Statistical significance was considered when p<0.05. Two fractions (F2 and F3) from F. prausnitzii supernatant exerted inhibitory effects on IL1-β-induced IL-8 secretion in intestinal epithelial CaCO2 cells (figure 1). For comparison, the MALDI-TOF mass spectrometry (MS) spectra generated from the culture medium fractions F2′ and F3′ and F. prausnitzii culture supernatant fractions F2 and F3 were also analysed. 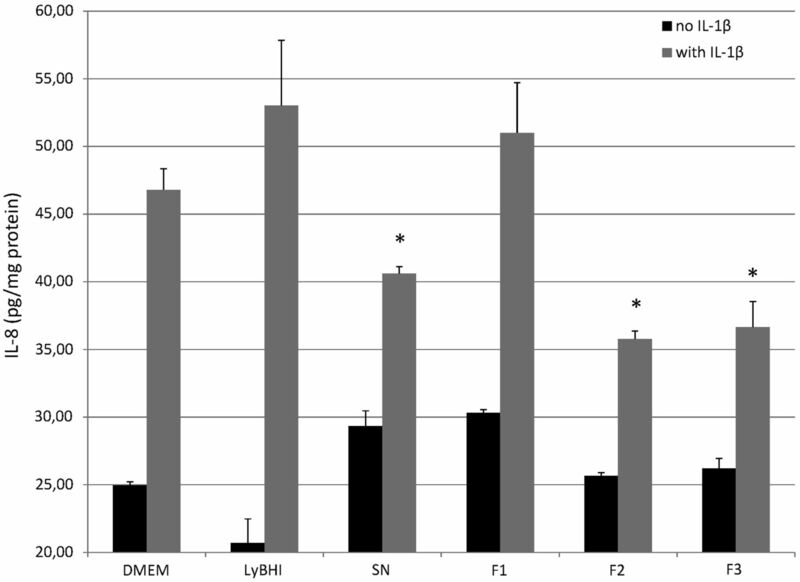 Interleukin (IL)-8 response of human Caco2 cells to stimulation in Dulbecco's modiﬁed Eagle's medium (DMEM) medium with IL-1β, Faecalibacterium prausnitzii supernatant (SN) or LyBHI medium, and F. prausnitzii supernatant fractions F1 (20% of acetonitrile), F2 (40% acetonitrile) and F3 (80% acetonitrile). 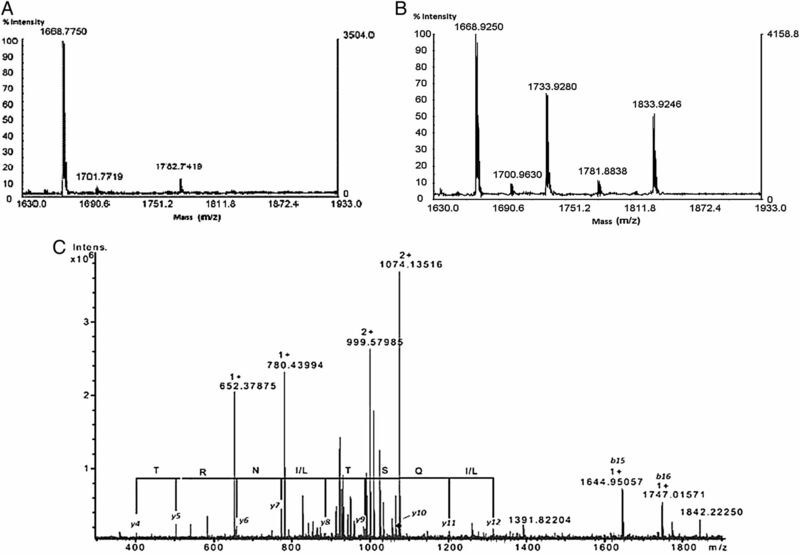 The values are expressed as the mean±SEM in picogram IL-8/mg protein. *p<0.05 (compared with DMEM with IL-1β control in three experiments). Analysis of F2′ and F3′ versus F2 and F3 using MALDI-TOF MS allowed us to detect seven ions ([M+H]+ m/z 1733.93, 1832.92, 1946.97, 2047.95, 2146.94, 2579.72 and 4601.06) in F2 and F3 fractions only (figure 2A, B and see online supplementary files S1–S3). The seven ions of interest were fragmented by an electrospray ionization (ESI) FT-ICR mass spectrometer and identified by de novo sequencing. Matrix-assisted laser desorption/ionisation-time of flight MS spectra (zoom scan for the m/z range 1630–1933) generated from F2′ (A) and F2 fractions (B) showing two ions at m/z 1733.93, 1832.92, only in (B) MS spectrum. (C) Fourier Transform-Ion Cyclotron Resonance collision-induced dissociation spectrum of the [M+2H]2+ m/z 1073.61 precursor ion (corresponding to the ion of interest [M+H]+ m/z 2146.94). De novo sequencing generated a probable partial amino acid sequence from singly charged ions. The accuracy of mass determination made it possible to attribute this series unambiguously and to differentiate between the isobaric amino acids K and Q. To illustrate the identification of compounds, one ion of interest (here: m/z 2146.94) corresponding to [M+2H]2+ m/z 1073.61 was fragmented by collision-induced dissociation (CID) (figure 2C). From various CID spectra (zoom, deconvoluted, product ion at [M+2H]2+ m/z 831.96), the complete sequence was finally obtained unambiguously: VT[I/L]VGNTF[I/L]QST[I/L]NRT[I/L]GV[I/L] (see online supplementary files S4–S6). The isomeric amino acids in square brackets [I or L] were undefined. The same procedure was used to determine the sequence of the six other peptides. The in silico analysis of F. prausnitzii genome (Blast and ProteinInfo software with NCBInr) first allowed to complete the sequence of the peptide 4600.28 Da, removing any ambiguity between leucine and isoleucine, and then to demonstrate that the seven isolated peptides all derived from the F. prausnitzii protein ZP 05614546.1. Sequences of protein ZP 05614546.1, called MAM (microbial anti-inflammatory molecule or named after its discoverer Marie-Anne Maubert), and its derived peptides are presented in table 1. To investigate structure/function relationships of MAM protein, a sequence search was performed using the program BLAST. The BLAST search recovered several sequences that are homologous to MAM, all belonging to F. prausnitzii strains (figure 3), with statistically significant, low e-values. 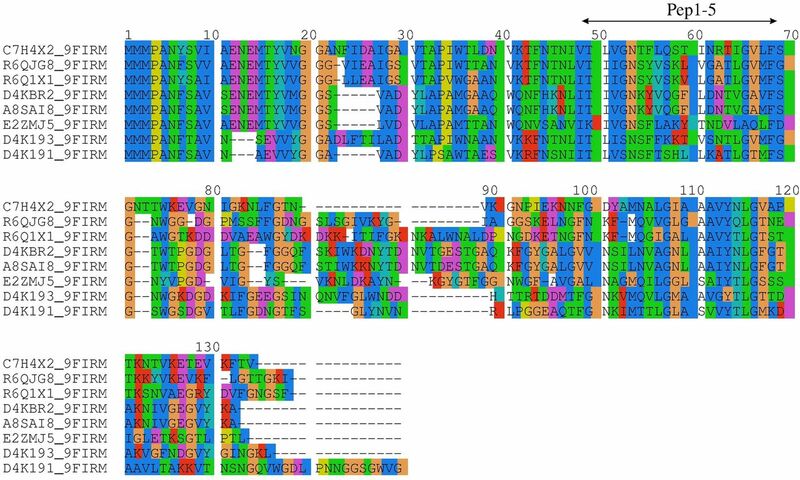 The sequence alignment of MAM to its other F. prausnitzii counterparts (figure 3) revealed high sequence identity (>34%), with strong sequence conservation in the 1–71 N-terminal part and in the 105–118 segment (MAM numbering). The characterised peptides Pep1-5 corresponded to a region of the protein, which is conserved in F. prausnitzii orthologs. Sequence alignments between microbial anti-inflammatory molecule protein and seven other homologous proteins of Faecalibacterium prausnitzii. Sequences were identified using a BLAST search and aligned using ClustalW2 program. The protein identifiers correspond to the following F. prausnitzii strains: C7H4X2, A2-165; R6QJG8 and R6Q1X1, sp. CAG:82; D4KBR2, SL3/3; A8SAI8, M21/2; E2ZMJ5, KLE1255; D4K191 and D4K193, L2-6. The region corresponding to identified peptides Pep1-5 is shown by an arrow. A sequence analysis based on ExPASy bioinformatics tools indicated that MAM does not contain regions of low sequence complexity and intrinsic disorder and should therefore adopt a compact, globular fold. Although the sequence exhibited two highly hydrophobic regions around residues 23–38 and 103–121, MAM was not predicted as a transmembrane protein using DAS-TM, HMMTOP or PHDhtm programs. In order to get further structural information on MAM protein, the results of the BLAST search were examined using the hits displaying higher e-values. Some sequence similarity was observed with proteins belonging to other Firmicutes (Roseburia intestinalis) having a putative GGDEF domain. A sequence alignment of MAM with this GGDEF domain yielded 15% sequence identity and 38% sequence similarity over the whole sequence, both proteins having comparable sizes (figure 4A). Based on these results, a homology model was tentatively built using Modeller program 38 (figure 4C). The inspection of the model indicated that the spatial distribution of polar and hydrophobic residues was compatible with such a globular fold. GGDEF domains share a α/β topology typically composed of a five-stranded β-sheet core flanked by five α-helices (figure 4B). The alignment showed that the short C-terminal β-strand was absent in the MAM model, as also observed in some GGDEF domains.39 Interestingly, the region encompassing the characterised peptides Pep1-5 corresponds to helix H3 and is exposed at the surface of the model (figure 4C). Homology model of microbial anti-inflammatory molecule (MAM) protein based on a GGDEF domain template. (A) Sequence alignment of MAM and GGDEF protein from Methylococcus capsulatus (Q60BX6); (B) X-ray structure of template protein (PDB entry 3ICL) showing the secondary structure elements; (C) three-dimensional model of MAM calculated with Modeller. The root mean square deviation on Cα positions of aligned residues is 1.1 Å. The region 49-68 corresponding to the identified peptides Pep1-5 is coloured in yellow. MAM protein produced through heterologous expression system (eg, E. coli) was systematically found in hydrophobic fractions, thus compromising any direct testing of anti-inflammatory effects. To circumvent this problem, MAM-derived peptides were functionalised (pegylation, cell penetrating peptide (CPP) coupling, modification of peptidic bond and others) and/or mixed with amphiphilic partners to optimise their solubility. However, none of these compounds showed significant and reproducible anti-inflammatory effect in cellular assays. We thus decided to change our strategy. Previous experiments suggested that F. prausnitzii supernatant acts distally on NF-κB pathway in epithelial cells (data not shown). We reasoned that MAM or its derived peptides could act on intracellular targets. We thus assessed the effect of direct overexpression of MAM protein in epithelial cells. A full-length FLAG-MAM cDNA was transfected in HEK293T and HT29 cells and the effect of the expressed protein was tested on NF-κB pathway, since preliminary experiments, using a multiplex assay (see the Material and Methods section), suggested an effect on the distal part of this pathway (data not shown). Expression of MAM was confirmed in HEK293T, MD2-TLR4-CD14 HEK293T and HT29 cells by western blot analysis with anti-FLAG antibody (see online supplementary file S7). Using a NF-κB reporter system in these human epithelial cells, we showed that expression of MAM protein was able to block NF-κB activation induced by Carma-1 or LPS in a dose-dependent manner (figure 5A–C). The specificity of the NF-κB activation in our system was validated by the inhibitor effect of SN50, a well-known NF-κB inhibitor. Moreover, the specificity of the effect of MAM on the NF-κB pathway was highlighted by the lack of effect on STAT3 pathway in the same eukaryotic system (figure 5D). Decrease in activation of the nuclear factor (NF)-κB pathway after transfection of microbial anti-inflammatory molecule (MAM) protein in different epithelial cells: in HEK293T in a dose-dependent manner (A), in intestinal cells HT29 (B) and in TLR4/MD2/CD14 stably transfected HEK293T stimulated by lipopolysaccharide (LPS) (C). No activity of transfected MAM protein was observed on the STAT3 pathway (D). *p<0.05 (compared with activation control). When NF-κB activation was performed using IκκB (distal part of the NF-κB pathway), MAM-transfected cells still exhibited a reduced NF-κB activity (figure 6). Decrease in activation of the nuclear factor (NF-κB) pathway after co-transfection of microbial anti-inflammatory molecule (MAM) protein and IκκB in HEK293T (*p<0.05). In agreement with this last result, MAM protein was localised around the cell nucleus in MAM-FLAG transfected HeLa cells (figure 7A–D) and co-localised with IκκB in transfected HEK293 T (figure 7E–H). Subcellular location of microbial anti-inflammatory molecule (MAM) protein in HeLa cells (A–D) and co-localisation of MAM protein with IκκB in HEK293T cells (E–H). E and J labels correspond to staining controls in untreated cells. To mimic more adequately the in vivo situation, a food-grade bacterium, L. lactis was modified to produce the cDNA coding for MAM, resulting in a kind of ‘in vivo transfection’. This allowed delivery of MAM cDNA directly by bacteria in mice subjected to DNBS treatment. Although no heterologous protein is produced by the bacterial strain, we verified that there is no difference in the growth between L. lactis pILEMPTY and pILMAM (see online supplementary file S8). To confirm that our strategy effectively leads to in vivo production of MAM, we performed western blot analysis on small bowel and colon epithelial cells of mice fed with L. lactis (figure 8). Expression of MAM at the mRNA level was also confirmed (see online supplementary file S9). Weight loss was significantly lesser in mice fed with L. lactis pILMAM at day 1 and 2 (figure 9B). After dissection of the gut, the Wallace score was also significantly lower in pILMAM (figure 9A). We subsequently isolated lymphocytes from MLN of both mice groups and assessed their cytokine production following stimulation with anti-CD3 and anti-CD28 antibodies. 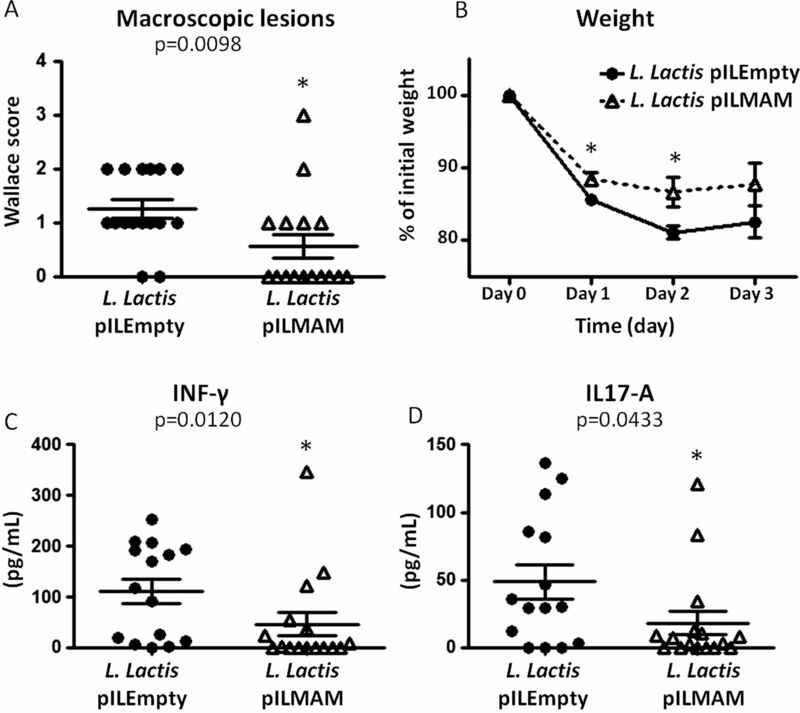 The two pro-inflammatory cytokines IL-17A and INF-γ were produced in lower amounts in cells isolated from L. lactis pILMAM fed mice (figure 9C, D). No histological differences were observed between mice fed with L. lactis pILMAM and L. lactis pILEMPTY (see online supplementary file S10). Taken together, these results show that L. lactis pILMAM exhibits significant protective effect in DNBS-induced colitis. Western blot with anti-FLAG antibody for microbial anti-inflammatory molecule (MAM) protein detection in small intestine enterocytes (1) and large intestine enterocytes (2) of mice fed with Lactococcus lactis pILEmpty and in small intestine enterocytes (3) and large intestine enterocytes (4) of mice fed with L. lactis pILMAM. Effects of intragastric administration of Lactococcus lactis bacterial suspension (pILMAM or Empty equivalent) on dinitrobenzene sulfonic acid (DNBS)-induced colitis in C57BL/6 mice considering Wallace score (A), weight after induction of colitis (B) and quantification using ELISA of interleukin (IL)-17A (C) and interferon (INF)-γ (D) in colons obtained 48 h after DNBS colitis induction (in pg/mL of total proteins). The values are expressed as the mean±SEM (*p<0.05 compared with L. lactis pILEmpty controls). MAM, microbial anti-inflammatory molecule. MAM mRNA was detected in vivo for the first time in our model of dixenic mice E. coli/F. prausnitzii (figure 10). Sequencing confirmed that the detected mRNA was MAM encoding mRNA. 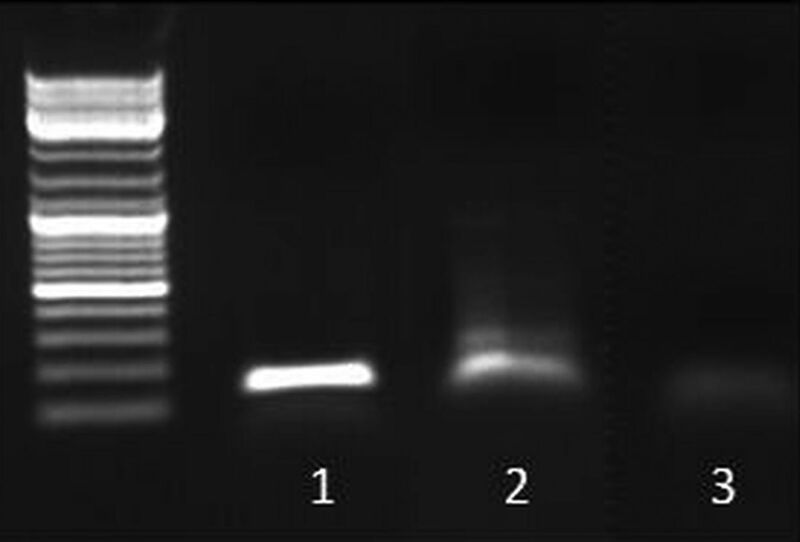 PCR detection of microbial anti-inflammatory molecule gene on RNA extract from faeces of dixenic mice colonised with Faecalibacterium prausnitzii and Escherichia coli (1), on pILMAM plasmid (2, positive control) and on RNA extract of sample 1 traited by RNAse before RT-PCR (3, negative control). Herein, we were able to identify a unique and original 15 kDa protein (ZP05614546.1), called MAM, with anti-inflammatory properties produced by F. prausnitzii. This protein and/or derived peptides involved in the anti-inflammatory effect are able to inhibit the NF-κB pathway in several intestinal epithelial cells lines. Interestingly, L. lactis delivering a MAM encoding plasmid was also able to prevent DNBS-colitis in mice. This discovery is in line with a series of work performed by our group. Indeed, for many years, we and others have described CD-associated dysbiosis and observed a strong restriction in the biodiversity of the Firmicutes (one of the two major bacterial phyla in the normal gut microbiota40) and a quantitative decrease in bacteria belonging to Clostridium leptum group.6 ,14 ,41 F. prausnitzii is a dominant species of this group. We have gone a step further, looking at the impact of these changes in gut microbiome on outcomes of patients with CD and inflammation pathways. In this setting, we were able to show that low level of F. prausnitzii in ileal mucosa of patients with CD was predictive of postoperative recurrence 14 and again, more recently, we observed that low level in F. prausnitzii in faeces was predictive of CD relapse in patients in remission.42 Moreover, this bacterium exerts anti-inflammatory properties in vitro and in vivo.14 In this previous work, the anti-inflammatory effects of F. prausnitzii were mediated by secreted molecules in the culture supernatant. These bioactive molecules were highly suspected to be protein-derived peptides from F. prausnitzii. Thus, it remained a major task to isolate these molecules, to characterise and to analyse their immunomodulatory effects. We met several difficulties in achieving these goals. First, finding bioactive molecules in F. prausnitzii supernatant was challenging. We made it possible by using a bio-guided strategy generated from the culture medium fractions and differential MALDI-TOF MS analysis. Thanks to ultra-high resolution of the FT-ICR, the complete sequences of the peptides were finally obtained unambiguously by de novo sequencing. To note, the easy coupling of mass spectrometry with separation techniques, such as liquid chromatography, and its sensitivity makes it a method of choice for detection of various molecules present at trace levels in complex mixtures, such as a bacterial supernatant. Surprisingly, after in silico analysis, the seven peptides all originate from the same unknown protein ZP05614546.1 from F. prausnitzii. Some sequence similarities were observed with proteins belonging to other Firmicutes (Roseburia intestinalis) having a putative GGDEF domain. These proteins are described in the UnitProtKB database as putative since they have not yet been characterised and have unknown functions. Strikingly, MAM protein does not resemble any other known protein from Gram-positive or Gram-negative bacteria. These GGDEF domains are typically found in enzymes endowed with diguanylate cyclase activity and involved in the biosynthesis of cyclic di- cyclic guanosine monophosphate (di-GMP), a widespread signalling molecule in bacteria.43 Accordingly, a BLAST search against the PDB database also revealed a hit with a protein from Methylococcus capsulatus containing a GGDEF domain. Although MAM protein might fold as a GGDEF domain, it lacks the critical catalytic residues (including the GGDEF sequence) that are involved in diguanylate cyclase activity. Furthermore, other residues involved in nucleotide binding such as the arginin-x-x-aspartic acid (RXXD) motif39 are also missing. It is therefore very unlikely that MAM has any catalytic or regulatory functions involved in cyclic di-GMP signalling. Thus, no clear function could be assigned to this protein. High prevalence of non-polar residues prevented us to provide direct characterisation of the putative anti-inflammatory activity. To overcome this technical lock, we applied a molecular approach by transfecting MAM cDNA in a series of epithelial cell lines and showing a significant decrease in the activation of the NF-κB pathway with a dose-dependent effect. Finally, an L. lactis strain delivering a MAM encoding plasmid was able to prevent DNBS colitis in mice. These results demonstrate that MAM protein supports, at least partly, the anti-inflammatory effect exerted by F. prausnitzii. One can hypothesise that F. prausnitzii could exert its anti-inflammatory effect on host cells through many molecular patterns. In fact, when performing preliminary experiments on F. prausnitzii supernatant, we observed that anti-inflammatory effect was not abrogated by heat (above 70°C), enzyme digestion (trypsin, lipase, amylase) or MW filtration (below 15 kDa) (M A Maubert, unpublished data). This indicates that various metabolites other than MAM could contribute to this effect. Furthermore, it has been shown recently that F. prausnitzii is a major inducer of Clostridium-specific IL-10-secreting regulatory T cell subset present in the human colonic lamina propria and blood.44 This indicates that several cell types are targeted through interactions between F. prausnitzii and the host to maintain and shape gut barrier immune function. In this setting, bacterial metabolites such as the abundant microbial-derived short-chain fatty acids (SCFA) have been identified to induce signalling effects regulating colonic regulatory T cell homeostasis.30 To note, human colonic butyrate producers are Gram-positive Firmicutes from which the two most abundant groups are related to Roseburia spp. and to F. prausnitzii. In fact, the intestinal tract of mammals is home to 1013 to 1014 commensal bacteria composed of hundreds of species of which certain are able to play specific roles in determining the immunological balance in host.27 ,45 Atarashi and colleagues have recently demonstrated that Clostridial spp. induce regulatory T cells through SCFA pathway stimulating epithelial cells to produce tumour growth factor (TGF)-β, contributing to regulatory T cells differentiation and expansion.46 Other species-specific bacterial molecules, such as B. fragilis-derived polysaccharide A, have previously been demonstrated to have immunomodulatory functions.47–49 Another study demonstrated that a mixture of probiotic strains, including Lactobacillus and Bifidobacterium, enhanced the production of TGF-β and indoleamine 2,3-dioxygenase (IDO) from dendritic cells and consequently induced Treg cells.50 Thus, our work uncovering a new anti-inflammatory protein from F. prausnitzii, a major microbiota species of gut microbiota, reinforces the role of a metabolic interface of promiscuous bacterial molecules on gut mucosa physiology. However, a metabolomic approach based on gnotobiotic model permitted to propose other hypothesis concerning F. prausnitzii anti-inflammatory properties.20 Authors identified various metabolites, particularly salicylic acid, specifically associated with the presence of F. prausnitzii. This study, associated to our results, confirm the complex action mechanisms of F. prausnitzii to limit the inflammatory process. To conclude, our work opens new lines of evidence that the impact of CD-associated dysbiosis could, at term, change our practice and lead to novel strategies to prevent and treat IBD. Although discovering an anti-inflammatory molecule constitutes a first step towards new anti-inflammatory drugs in CD, MAM could represent a targeted biomarker for CD, regarding the value of F. prausnitzii for predicting CD relapse. In these perspectives, there is further need for deciphering the role of MAM in the gut ecosystem. In particular, emphasis should be placed on finding the function of MAM and the mechanism of its production within the bacteria before considering it a target for CD management. We also thank Lucette Groisard, Loïc Brot, Chantal Bridonneau and Isabelle Naas for technical assistance and Joëlle Masliah and Muriel Thomas for their scientific support. Marie-Anne Maubert thanks Jean Claude Tabet and the TGE High Field FT-ICR (CNRS) for providing the access to the FT-ICR mass spectrometer. Caecum content of Gnotobiotic mice harbouring F. prausnitzii (A2-165) and Escherichia coli (K-12 JM105) subjected to 2,4,6-trinitrobenzenesulfonic acid (TNBS)-induced acute colitis have been gently given by Sylvie Miquel and Muriel Thomas.
. High-frequency transformation, by electroporation, of lactococcus lactis subsp. cremoris grown with glycine in osmotically stabilized media. Appl Environ Microbiol 1989;55:3119–23.
. Efficient plasmid mobilization by pIP501 in Lactococcus lactis subsp. lactis. J Bacteriol 1993;175:5806–13. EQ, MAM, CM, HS and PS contributed equally. Contributors PS, PL, HS, GTr, LGB-H, SL and OL designed research; MAM, EQ, GTh, CM, FC, RM, JT, PK, BP, LC, SM, CA, NB, and HS performed research; EQ, MAM, SL, OL, JPG, GC, LB, JMC, PL, HS and PS analysed data; and EQ, MAM and PS wrote the paper. Funding We thank Association François Aupetit (2009) and Agence Nationale de la Recherche (Mi2 2010) for funding this work. This last study was a part of the FPARIS collaborative project selected and supported by the Vitagora Competitive Cluster and funded by the French FUI (Fond Unique Interministériel; FUI no. F1010012D), the FEDER (Fonds Européen de Développement Régional; Bourgogne no. 34606), the Burgundy Region, the Conseil Général 21, and the Grand Dijon. This work was also supported by Merck Médication Familiale (Dijon, France) and Biovitis (Saint Étienne de Chomeil, France). Competing interests PS declares consulting fees from Abbvie, MSD and Biocodex. HS received consulting fee from Danone and Enterome and lecture fee from Abbvie and Biocodex. For the other authors, they declare that the research was conducted in the absence of any commercial or financial relationships that could be construed as a potential conflict of interest.